Many aids exist to help smokers to quit smoking and kick their habit: e-cigarettes, prescription medicine, hypnosis, or sheer will-power. When a person who has smoked for any amount of time realizes how the ingredients in cigarettes damage the body, it can help in the step towards quitting smoking. According to Carol Orsag Madigan, author of Life’s Big Instruction Book, the body begins to show signs of damage reversal within 20 minutes of smoking a final cigarette. Within 48 hours, notable body functions begin to awaken, and the chances of succumbing to the ultimate penalty for smoking, lung cancer, cuts nearly in half within a matter of years. The following describes how the body begins to repair itself when a smoker extinguishes his last cigarette. Within 20 minutes from the last cigarette, the body’s blood pressure and pulse rate drops back down to normal. The temperature of the hands and feet resume their normal body level as well. Carbon monoxide, one of the deadly ingredients in cigarettes, increases in level when cigarette smoke is inhaled. Within eight hours of a final cigarette, these deadly carbon monoxide levels in the blood drop back to normal. In return, blood oxygen levels then increase to a normal level as well. The chances of having a heart attack decrease within the first 24 hours of quitting smoking. After 48 hours without a cigarette, the ability to taste and smell functionally returns. The nerve endings in the body also begin to repair themselves by regrowing. Within one full day after these remarkable events, or within 72 hours after the last cigarette, lung capacity increases and the ability to breathe becomes extraordinarily easier due to the bronchial tubes relaxing. Anywhere between two weeks and three months after a smoker finally stops inhaling tobacco smoke, the blood begins to move easier throughout the body, due to increased circulation. This, in turn, makes it easier to walk. Within this short period of time, lung function can improve up to 30%, according to Madigan. Many of the effects of smoking are noticeable through respiratory and sinus functions. 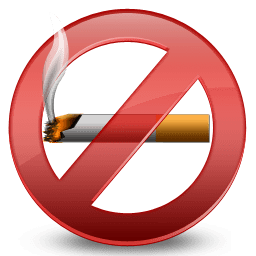 Within one to nine months of quitting, a smoker can see a remarkable improvement in smoking-related coughing, fatigue, sinus congestion, and breathing difficulties. This is the time period when cilia, the hairs inside the lungs that handle mucus and reduce infection, begin to repair themselves significantly. Because of these overall improvements in the body, energy levels that have been compromised from the smoking increase. According to the Center for Disease Control, 85% of lung cancer deaths are smoking-related. Heavy smokers have as much as four times greater risk of dying of cancer than non-smokers. Within five years of quitting smoking, the chances of lung cancer can be cut by nearly half. Quitting smoking sooner rather than later can aid the body in healing itself before irreversible damage occurs. 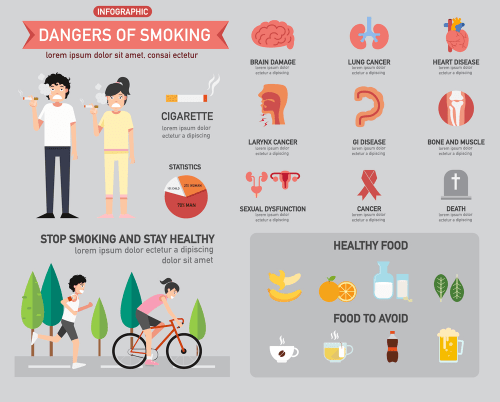 Smoking is related to many forms of cancer, not just lung cancer, including throat and esophageal, bladder, pancreas, and kidney cancer, that can be eliminated by avoiding the dangerous chemicals in cigarettes. Many benefits can be seen immediately by quitting smoking for good, and because the ingredients in cigarettes are shown to be addictive, those who are having a hard time quitting should contact a local physician to gather information on aids that are available to help.